Embroidery has many secrets and one of its real power lie in the fact one can take any textile and transform it into something amazing, that is what happens to embroidered womens jeans. 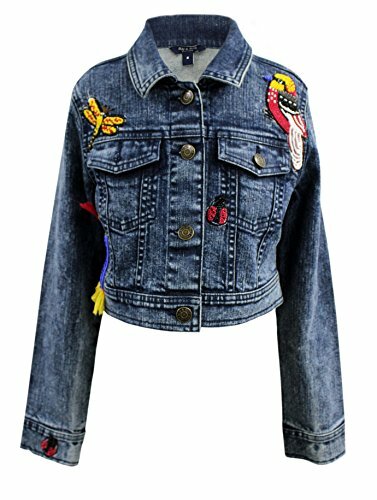 Embroidered Womens Jeans and other denim outfits such as jacket have hit the fashion passarel in the latest shows since 2017. 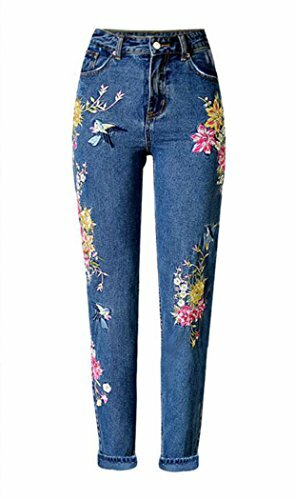 And today we are going to talk about embroidered denim jeans women in modern embroidery. As an age old textile craft, embroidery is often incorporated into both couture and ready to wear collections. But the technique hit a high note for Spring/Summer ’17, with several designers using artisanal designs in dramatic denim looks. Runways were rife with a vintage inspired mood: Alice and Olivia featured a chambray pouf dress with delicate white flowers, along with low rise bells with a floral design creeping upward from its exaggerated flare. Alexander McQueen sent head-to-toe denim looks heavy in baroque-inspired flora embroidery down the runway, worn from coat to clog in an artfully distressed finished. Red Valentino’s denim offering featured a fluttering of butterflies on denim co-cords such as a bralette — another trending style for the season — worn with matching high waisted denim. Though the embroidered denim jeans trend is rooted in a ’60s/’70s-era sensibility, wearing a heavily stitched jean piece need not read as retro. Choose pieces wisely, opting for versatile separates that can be worn with a simple, streamlined ensemble, adding just a touch of embroidered flair. Embroidered pieces that can transition through the seasons, like shirts and dresses, along with accessories like clutch bags, can be layered underneath sharp blazers or paired with a tonal ensemble for just a pop of color. For those afraid of long-term commitment, an embroidered patch allows you to experiment with the trend now with the freedom to remove it later. Channeling the subversiveness of its ’60s roots, embroidered patches can transform a relatively plain pair of jeans or a denim jacket into a subtly flamboyant, of the moment piece. However, those partial to flora and fauna designs and wanting to push the boundaries may want to reach for one of the jackets from Alessandro Michele’s decorative Spring/Summer ’17 collection for Gucci. 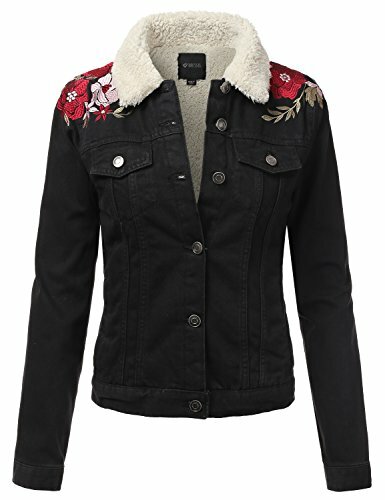 There’s a choice of tiger, bird and flower patterns, along with French phrases along the back of a shearling collared jacket. Styled with plaid, high waist trousers and Dr. Martens, you have the makings of a look that would make any ’90s Seattle grunge fan proud. As a casual wardrobe staple, denim can be styled in a seemingly endless number of ways, ranging from sporty to slightly more tailored and put together. A pair of classic, straight-leg jeans with a rose-embroidered pocket easily team with a classic white shirt and a pair of punchy crimson footwear, drawing out the coloring of the stitching. For an oversized, boyfriend denim jacket with an embellished back, a streamlined, midi pencil skirt or pair of trousers in a block color with sneakers might complete an off-duty look. Outfits featuring over the top, ethnic-inspired embroidery pair well with minimal accessories such as flat sandals, cross-body bags and a single statement cuff. For dressier, after-dark occasions, there are two schools of thought: either opt for slightly more restrained embellishment, or alternatively, turn up the glamour with heavy, all-over embroidery in a classical baroque style. Look to Olivier Rousteing’s earliest collections as creative director for Balmain (Autumn/Winter ’12 in particular) for inspiration. Darker denim in deep marine or black in cropped and A-line skirt styles, and mini dresses and tunics benefitted from embroidered floral motifs nestled amongst rococo-style pearls and beading. Streamlined silhouettes offset the bulk of embroidery and were instantly evening appropriate when worn in micro lengths with ankle boots or with tailored separates such as an embroidered denim jacket ladies with a slick, cropped leather trouser. With embroidery having made such a strong, cyclical comeback, you can be sure that whatever ornate separate you choose to invest in will make a big impact this season and in the decades to come. For all the above reasons we advocate for embroidered womens jeans this coming 2019 in all its versions, size and shapes. Blue jeans or denim garments are good for all seasons since its casualness make it easy to combine with any other outfits one may choose. Enrich your wardrobe by adding some chic embroidered womens jeans to it; it will never be worn out.